Reilly Gradient. Our new favourite bike? 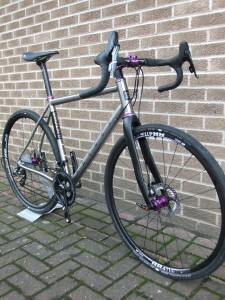 Reilly Bikes based in Suffolk are producing some very fine bikes indeed and their latest creation is one of the best yet. The Gradient was launched to glowing reviews and since we built a frame up has been one of the most admired bikes in the shop, and their is plenty of competition. It may be a cliche but the pictures really dont do it justice. The Reilly Gradient built with butted titanium tubing could be one bike for almost everything. There is plenty of tyre clearance for off road adventures, it is light enough for the club run, tough enough to tour on and pretty enough to admire for many years. The rear features direct mount brake fittings and bolt through axles, cables are mostly internal with some very neat fittings to take the brake hoses through the frame. The bottom bracket is a user Frame prices start from £1400 and within reason we can build you anything you want around one of these frames. Custom finishes and custom geometry are also possible if you wish.